Take a tour of our Children’s Department! Our Children’s Room offers many activities, services and materials for children and parents. Library materials include: books, audio books, magazines, music, DVDs, foreign language materials, parent reference books and magazines, preschool toys and more. Family library programming includes: baby, toddler and preschool story hours, elementary age book groups, craft sessions, film showings, teen programs, family nights, parenting programs and many other special events. Ask us about our new programming for homeschooling families and titles that support the Common Core Curriculum. Happy May! There is much to do and explore at the Essex library this month, and we hope that you’ll come in and visit. We’re celebrating Children’s Book Week (April 29 – May 5) with a handful of story hours and great book displays. We’ll kick off the festivities with a Nutmeg Release Party, see our friends from Denison Nature Center, and throw a festive Tea Party. For more information on our featured events and literacy programs, please read below. Our sincere thanks go out to the Guilford Savings Bank for the generous donation needed to help improve our Children’s Non-Fiction Department. Stop by anytime to see our enhanced shelving, and check out our impressive new selection of: science, history, technology, engineering, art, and math books. The teen Book Society is back mid-month with conversation about Dystopian and Fantasy favorites. This club sometimes meets in the teen department where we now feature art made by young adults. If you or someone you know has at least 5 pieces of art and would like to display that work for sale, please contact Jessica at jbranciforte@essexlib.org or by calling 860-767-1560. Thank you, Community Foundation of Middlesex County! 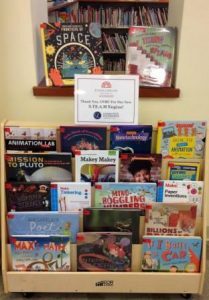 With the generosity of this foundation, we were able to purchase a new rolling book display and 60 new non-fiction titles focused on science, technology, engineering, art and math. We are so thrilled to add cutting edge information to our growing non-fiction section. Come on in to learn more about the solar system, modern biologists, animal science, engineering and more. Request a book – or a book list! Many parents and teachers in the community need a list of great books from time to time. Readers’ advisory is one of our favorite tasks here at the library. We often put out generic lists, but know that there are times when you have something more specific in mind. Right now, for example, we’re focusing on booklists regarding hibernation and the Thanksgiving holiday. Perhaps you’re in need of a list of great resources about apples or a special holiday. Send us a line! We’d love to cultivate a list tailored to your reading needs, and we can pull the items or place holds on specific titles any time. As our new website develops, we’ll be linking interactive lists online for you as well. Email Jessica at any time at jbranciforte@essexlib.org or call the library at 860-767-1560. Looking to treat your child or to reward positive behavior? He or she may be celebrating a special milestone like learning to read or may have recently received a compliment from a teacher or coach. Whether your child has had a great sports season or has been an excellent help around the house, we’d like to assist you in rewarding them with a gift. With your help, we would love to put a new picture book or novel into our collection in their honor. What a treat! For more information, contact Jessica at any time at jbranciforte@essexlib.org or call the library at 860-767-1560.